Vintage McCall sewing pattern 4747. 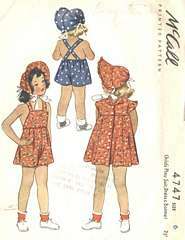 Child's play suit, front button dress and brimmed bonnet. Size 6; Breast 24; Waist 22. Pattern is complete; several pieces are cut. Envelope is in good condition.